What to know: A breathtakingly unique twist on the classic superhero movie. The film Glass is breathtaking! This unique film is such a great combination of comedy, action, and drama and that's what makes it unique and different. I didn't want to look away during any part of the film, because every second you feel like you want to know more. The way each story is laid out is outstanding. Each character is so unique and all have their own strengths and weaknesses. The film is so extraordinary that you think you have powers. The storyline is about three people who have amazing gifts that are so unbelievable that they start to believe they are more then just a person with amazing gifts. Then, a doctor finds out about them and takes them in because she doesn't believe that they have extraordinary gifts. She believes they just have mental disabilities from accidents that happened to each of them during their lives. She tries repeatedly to make them believe that they are all normal with a disability, until they decide to do something insane to show her that they are not just a normal people and are special. This film will surely bring chills, smiles, laughter and maybe even tears to those who watch it. The main characters are: James McAvoy (Kevin W. Crumb/The Beast/Patricia/Barry), Bruce Willis (David Dunn), Samuel L. Jackson (Elijah Price/Mr. Glass), Sarah Paulson (Dr. Ellie Staple), Spencer Treat Clark (Joseph Dunn) Anya Taylor Joy (Casey Cooke), Charalayne Woodard (Elijah's Mother). These actors truly make you believe their characters are real and keep you on the edge of your seat with their performances. My favorite part is when Anya Joy (as Casey) speaks to Kevin Crumb who has split personalities - good and bad. During this conversation, Casey talks to all of Kevin's various personalities and the love she shows somehow fights off the other personalities. It is heartfelt to watch this scene because it shows how important their friendship is. The message of this film is that we are all special. All we need to do is express ourselves and not hide. Another message is that it doesn't matter if other people believe in you. As long as you believe in yourself, anything is possible. I rate this film 4 out of 5 stars and recommend it for ages 12 to 18, including adults. I truly believe that many who watch this film will really enjoy it. This film opens in theaters on January 18, 2018. Look for it! This action-packed film, directed by M. Night Shyamalan, puts a unique twist on the classic theme of a superhero movie. As another addition to Unbreakable and Split, this movie ties the series together well and I enjoyed it. The comic book thriller follows security guard David Dunn, who uses his heroic powers to find a troubled man named Kevin Wendell Crumb, who has a superhuman alter-ego and twenty-four distinct personalities. When the men are captured and taken to a mental institution, they encounter another character, named Mr. Glass. The doctor informs them that she has three days to convince them that superheroes are not real, but she is yet to realize that the three characters are meant to be connected by fate. This movie puts you into a new perspective, and makes you think differently. The stunt coordinator, Mohammed J. Ali, incredibly incorporated action and fighting into certain scenes. However, the plot is sometimes unclear and characters' roles are unbalanced, so some people receive more attention than others. My favorite scene is when the main characters sit in chairs and are asked to recall moments that make them believe they're superheroes. The doctor tries to convince them that there is a logical explanation behind these events, but as viewers, this is when we know that they have powers. The movie overall has a deep meaning that there are more complications than good and evil and the idea of superheroes clashes with modern day society. Although the movie contains some mild profanity and violent scenes, it is still a great film to watch. I rate this production 3 out of 5 stars and recommend it for ages 11 to 18, as well as adults. It opens in theaters Friday, January 18, 2019. Look for it! Glass kept me at the edge of my seat the whole time! This film takes the viewer on a rollercoaster of twists and turns. It's very well done with exceptional acting, which is what I like most about it. James McAvoy, Ana Taylor-Joy, Bruce Willis, Sarah Paulson, Samuel L. Jackson all make you feel as if you are inside the movie, living all the intense moments they go through as your own. M. Night Shyamalan's direction is outstanding. Everything is so well set up and all the questions are answered at the end of the film, giving it a suspense that keeps the audience engaged. 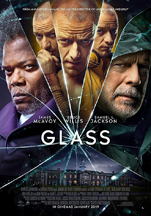 Glass is a mixture of narratives of two of standout originals, Unbreakable from Touchstone and Split from Universal in a new comic-book thriller. From Unbreakable, Bruce Willis comes back as David Dunn and Samuel L. Jackson as Elijah Price or Mr. Glass. From Split comes James McAvoy, replaying his role as Kevin Wendell Crumb and the multiple identities that reside within and Anya Taylor-Joy as Casey Cooke, the only survivor from the Beast. Following the conclusion of Split, Glass finds Dunn pursuing Crumb's superhuman figure of The Beast in several events, while the manifestation of Price appears as a mastermind that holds secrets critical to both men. Definitely this concludes the series in an unexpected, yet impressive way. My favorite part is when Kevin Wendell Crumb (James McAvoy) switches and acts like his multiple personalities when he is first taken into the mental hospital. For anyone that has seen Split, you get to relive how funny his impressions of the distinct personalities are and remember how much you enjoy them. The whole plot is so tense throughout, that it is good to have moments like these to breathe a little bit before the film goes back to more serious moments of the story. This is a very entertaining film that perhaps reminds us not to be friends with psychopaths. I recommend it to ages 14 to 18, plus adults and rate it 5 out of 5 stars. It opens in theaters January 18, 2018 so, look for it.